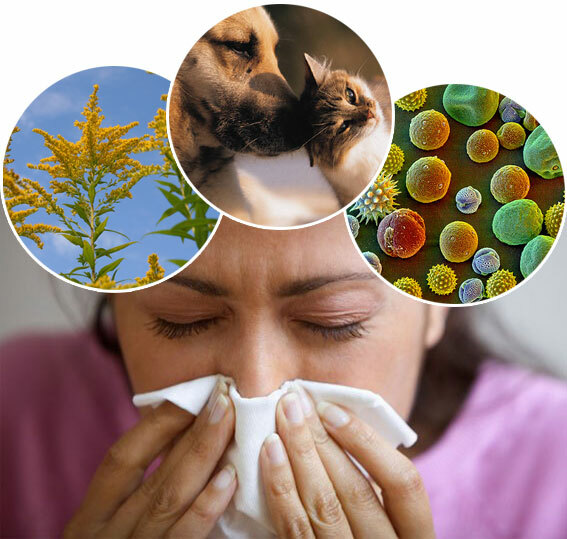 Allergy or unfavorable symptoms that appear in a specific time of the year. Seasonal allergy is also known as Hey fever and is normally caused when the plants release pollen in the air. The people who are sensitive to these pollen, their immunity system may take these particles as a threat and start releasing chemicals to cope with the problem. These chemicals released cause the symptoms of allergy. The symptoms of hay fever are similar to cold and cough but the level of its severity depends on the exposure with the allergens. The symptoms are as following. The seasonal allergies are very easily diagnosed because the pattern of repetition always occurs during the same period of time. Some common tests done by the physician are enough to point out the issue. History of patient is an easy indication to determine seasonal allergies as the allergy attack occurs at a specific time. Additionally, a thorough checkup of throat, ear and nose can ease the diagnosis. The doctor sometimes recommends the blood test to test the allergies. There are two types of skin tests which are done by the allergist to check the allergies. In it the allergist injects small amount of allergen under the skin of the patient. The allergens if stings the area and a lump is formed at that area just like a mosquito bite, the test is sad to be positive. Secondly, the allergist drops an allergen in special liquid form on the skin of the patient. If it stings and pricks after the use of the pricking device, the test is said to be positive. The skin near the tested area becomes red and swells as well. The seasonal allergy with sneezing in the morning right after waking with tickle in nose as its main symptom may be best treated using Homeo medicine Arsenicum. This medicine is especially best when patient suffers from abundant watery discharge from the nose that brings burning sensations over lips, nose, eyes or throat; restlessness and anxiety. Sharp pointed sensation inside the nose that forces to prick or pinch the nostrils making it sore is common during seasonal allergies. Arum Triphyllum is miraculous remedy for such symptoms for instant relief. It is also very helpful in the cases where patient experiences blocked nose, sneezing worsening at the night, fluid running from nose making redness and burning of skin where it flows and sore nose. Seasonal allergies reaching at the stage of violent and frequent sneezing with the inflammation of upper respiratory system demands Bromium to get the instant relief. Bromium also helps in relieving the symptoms like sensitivity to smoking, soreness of nose, corrosion under nose as well as aversion to drink cold water. Constant sneezing as seen in seasonal allergies cause high liquid discharge both from eyes and nose making these organs to swell. Such condition gets worst in open areas as compared to closed one. Dulcamara can help the patients to the great extent to ease such painful symptoms. Seasonal allergy may lead to the feelings of fatigue, hot face and tiredness of limbs and whole body along with frequent sneezing. The allergy can show even some violent symptoms like sneezing outburst in the morning, severe watery discharge from nostrils, tingling sensations in nose and burning sensations like hot water starting from throat towards the left nostrils. Gelsemium can be proved as a best remedy for all such symptoms for instant and long term relief. Lachesis is the magical Homeo remedy for seasonal allergy attacks in case when sneezing attack becomes worse while sleeping no matter if it is day time. The violent sneezing may lead to many complications like headaches, thickening of nose, congestion in head, redness of face and swelling of eyes. Soreness and redness of lips and nostrils is also seen in patients along with throat sensitivity to pressure or touch. Lachesis is the solution of all aforesaid symptoms. In some cases of Seasonal allergies, the sneezing may prolong to the distressing period. Patients suffer from extreme irritation in eyes, nose and even face as their face becomes hot. Additionally, an itching sensation traveling from palate towards the larynx and trachea is also noticed. Nux Vomica can help to ease all of such inconveniences. Sabadilla is one of the best Homeo remedies for seasonal allergies when the symptoms like intermittent but violent sneezing, stuffed nose, fluent watery discharge from nose and redness of eyelids are seen in the patients. Sabadilla is especially best in relieving the itching of the nose that sometimes leads the nose to bleed as well as the sensitivity of the patient from odor of garlic. The patients of seasonal allergy who constantly require to blow their nose but no discharge flows out of their nose need Sticta Pulmonaria as a remedy. The problem is that the allergy makes nose stuffed and secretions of nose get dries too rapidly to be discharged. This dried and stuffed nose makes the nose tingle along with constant sneezing, extreme dryness of the palate, tickling in pharynx and feelings of heaviness in the forehead. Sticta helps in releasing the stuffed material inside the nose in order to relief irritations and inconveniences. Seasonal allergy may cause an irritating feeling inside mouth from roof up to the ears and also soreness of throat with hoarseness. Wyethia is the best remedy for such patients having aforesaid issues. acute allergy at earley morning and night.